The Identicator Tread Print Kit provides a reliable and convenient way for criminal investigators to capture tread and tire track evidence during criminal investigations. By applying a specialized ink formula, investigators can acquire tire and tread images perfectly. This is a quick and simple method for obtaining high quality tire track impressions, which can "fill-in-the-blanks" during crime scene investigative procedures. Unlike other Tread Print products--this exemplary one doesn't require any further chemical development, or protection to guard against ink smudging. It dries immediately upon making contact with the high-end contact paper. 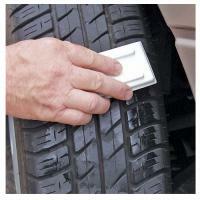 The cards can also be clamped together to provide investigators with a continuous roll-out recording, or a partial recording of the tires.